Thomas M Cooley Law School stories at Techdirt. stories about: "thomas m cooley law school"
We've written a few times about the infamous Thomas M. Cooley Law School, more famous for its terrible reputation and its own "ranking" system to try to hide that terrible reputation than for producing any decent lawyers. A few years ago, we wrote about the law school suing a former student, who was criticizing the school via an anonymous blog. Bizarrely, a district court allowed the school to unmask the blogger. Thankfully, however, an appeals court has now reversed the lower court ruling and said that the blogger has a right to anonymity. A unanimous Court of Appeals decided that the trial judge, Clinton Canady, was wrong to deny a protective order barring Thomas M. Cooley Law School from disclosing the name of a former student whom it had sued, alleging that harsh criticisms of Cooley on his blog, the Thomas Cooley Law School Scam, were defamatory. The majority opinion faults the trial judge for deciding that Michigan law does not require such a protective order, and for assuming that a public figure like Cooley is exempt from having to allege and prove actual malice simply because the Doe had called its conduct criminal. Under the ruling, Doe will be able to seek to have the complaint dismissed either on its face or for lack of evidence to support the claim that his blog is defamatory. That said, as Paul Levy notes, in the above blog post, this is not a complete victory, as the court failed to provide important guidance to future cases in Michigan concerning these kinds of issues, and specifically fell down on the important point of requiring notice in such cases. Many other courts have said that if you are seeking to unmask an anonymous commenter, there must also be notice to that anonymous person such that they can seek to block being revealed. The appeals court in Michigan decided not to establish that as a rule. For future cases, however, it is disappointing that the majority opinion, in its effort to avoid applying the Dendrite and Cahill standards directly, gave little guidance to trial courts about the standards under which anonymous speakers' requests for protective orders should be decided by trial judges. And most troublesome is the majority's deliberate refusal to address the notice requirement on which every other state appellate court has insisted, because otherwise an anonymous defendant may not know that a subpoena has been issued seeking his identifying information. Thus, while the Doe was well-protected in this case, that is only because Cooley Law School issued a press release announcing its defamation claims, enabling the Doe to file a motion to block the subpoena. A powerful opinion by Judge Jane Beckering concurs in the decision to overturn the denial of anonymity protection and remand the case, but strongly disagrees with the reasoning, arguing that Michigan should embrace the approach taken by almost very other state that has addressed the issue and adopt clear standards to guide trial judges. Judge Beckering explains that Michigan's existing rules require notice before subpoenas can be issued, and hence that appropriate First Amendment standards can be incorporated without any need to change the current rules. Remember the Thomas M. Cooley law school? The school, generally considered a 4th tier bottom of the barrel law school, made some news last month by suing some anonymous critics, who appeared to be unhappy former students blogging about the school. The school has also been sued for apparent misleading employment stats. Of course, somewhat related to all of this is the ridiculously laughable attempt by Thomas Cooley to hide its poor reputation by creating its own ranking system that puts itself as the number 2 law school in the country. Of course, its ranking methodology leaves a lot to be desired, using things like "total law school square footage," and "total volumes in library," and giving them equal rank to things like "bar passage rate" and "employment upon graduation." 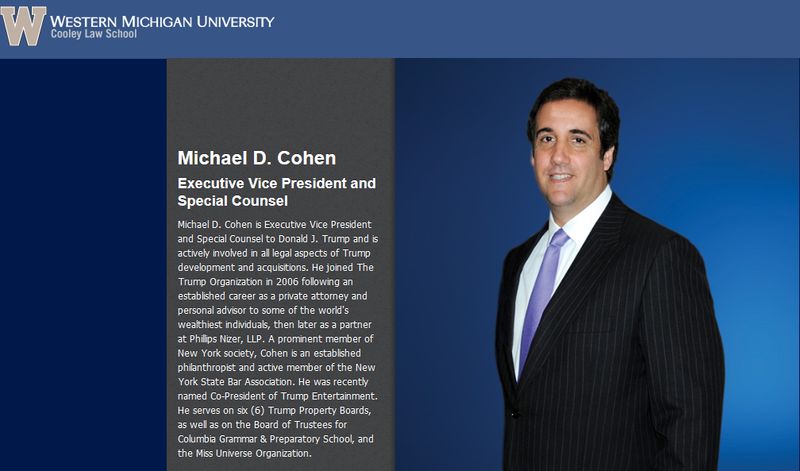 Anyway, the lawyer representing Cooley, Michael Coakley, who attended the (according to Cooley itself) far inferior law school of the University of Michigan, apparently decided to take some questionable steps in identifying one of the bloggers in question. Initially, he had filed a subpoena on the ISP via the Michigan state court where the case is pending, demanding identifying info. The blogger's lawyer, John Hermann, filed a motion to quash the subpoena. While the court was still considering that, Coakley went and had another subpoena for info served via California. While the ISP (more on that in another post) had promised Hermann that it would not divulge the info while the motion to quash was being considered, and then told him it wouldn't do anything before August 22nd, it apparently handed over the info on August 17th. Coakley then sent Hermann a letter saying that since the ISP had already identified the blogger from the second subpoena, Hermann's motion to quash the original subpoena was moot, and threatened to ask for sanctions against Hermann if he didn't drop it. He also threatened to reveal the blogger's name in a public court filing, if Hermann and the blogger did not agree to certain conditions and provide certain info. If information that is subject to a claim of privilege or of protection as trial-preparation material is produced in discovery, the party making the claim may notify any party that received the information of the claim and the basis for it. After being notified, a party must promptly return, sequester, or destroy the specified information and any copies it has and may not use or disclose the information until the claim is resolved. A receiving party may promptly present the information to the court under seal for a determination of the claim. If the receiving party disclosed the information before being notified, it must take reasonable steps to retrieve it. The producing party must preserve the information until the claim is resolved. Because Coakley is the head of the litigation department at a prominent Detroit law firm, he must have been aware of this rule. In fact, his letter could be read as expressing some defensiveness about his obligations, because he began by emphasizing that the disclosure really wasn�t his fault: the disclosure had occurred, he said, �without direction from us (other than the subpoena itself).� But the California subpoena was served after the motion to quash was filed in Michigan, and the threat to use the privileged information to exact concessions from Doe, and the subsequent filing of an amended complaint and other papers prominently displaying Doe�s name, seem to have been deliberate violations of the rule. Coakley has not responded to my requests for information and for comment on my concerns. Given how marginal his client's defamation claims against the Doe are, Coakley may have felt he had no choice but to skirt the ethical edge by violating this rule. (The linked complaint, which was a draft attached to Coakley's demand letter, reflects a false name; by the time it filed the amended complaint, it had used the disclosure to identify the Doe and put that name in the complaint). Coakley markets himself to potential clients by proclaiming his reputation as �a scrapper in protecting their interests.� As I see it, Coakley�s scrappiness took him a few steps too far in this case. Thankfully, the court seems to recognize this somewhat questionable activity on the part of Coakley, and has ruled that the disclosed information should be sequestered, and the papers filed in the case naming the blogger should be stricken from the record. Still, even if this lawyer isn't a Cooley grad, these actions certainly don't reflect well on Cooley as a law school.